this recipe, i got from Ted, J's brother, who's also into cooking that we dub him as the "cooking master boy!" 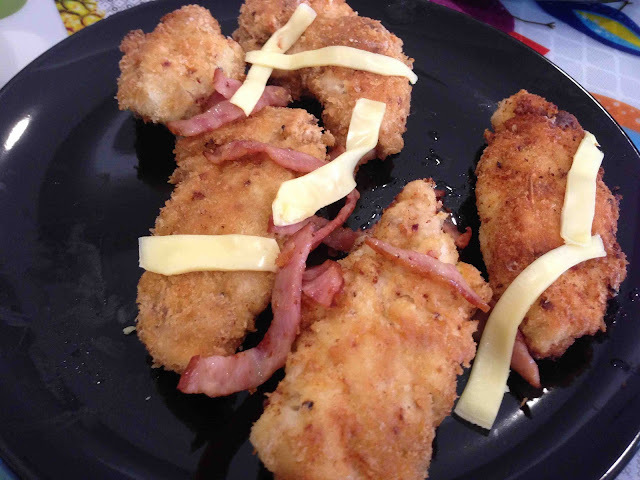 chicken cordon bleu is an absolute favorite! who knew it was easy to prepare? this version is the fried version, though some varieties come in the healthier grilled option, which i have yet to try. While waiting for the chicken, slice cheese to the desired size and thickness. Always keep in mind the size of the chicken breast used. Beat egg/s in a shallow bowl. In another shallow bowl, mix flour, corn starch, garlic powder cayenne pepper (optional) and black pepper. The ratio for flour to corn starch is 3:1. In another shallow bowl, put breadcrumbs (just enough for the chicken to be covered). After about 15 minutes, take out the chicken from the refrigerator and wipe the chicken dry. In a plate (large enough for a whole chicken breast to fit), place a chicken breast. place a slice of ham, slice/s of cheese and roll the chicken and secure with toothpick. As much as possible, there are no holes so that the cheese will not make its way out of the chicken. Do the same with the rest of the chicken. Dip a rolled chicken into the beaten egg (or into the buttermilk/milk if you're using that alternative). Roll and coat the chicken into the flour mixture. Roll and coat the chicken with the breadcrumbs. Repeat steps number 4 - 7 as desired. While doing steps 4-8; In a frying pan, heat oil. You will know if the oil is ready for frying when you try to sprinkle a pinch of flour and it creates a fine bubbles around it. When the desired temperature is reached, lower the heat from the stove. Place one (1) or two (2) chicken in the frying pan. Don't put a lot of chicken because we need to maintain the temperature. Cooked the chicken about 3 minutes or until the meat is tender. Remove the cooked chicken from the frying pan and strain. Wipe the excess oil with paper towels. Serve while hot and with steamed rice and sweet chili sauce or ketchup. You can slice the chicken or serve it whole with a steak knife.